On Canada’s Coat of Arms, there is a Latin phrase at the bottom that says “A Mari Usque Ad Mare.” This is Latin for “From Sea to Sea” and represented the dream that Canada’s founders had; a country that reached from coast to coast. That was easier said than done - there was no such thing as an airplane, cars or trucks. ‘From Sea to Sea’ meant covering a distance of over 5000 km - Canada needed something big. The Canadian Pacific Railway was the answer. On July 1, 1867 four provinces joined together to form the new country of Canada. 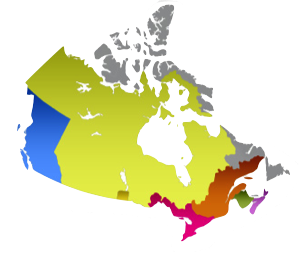 These 4 provinces - Nova Scotia, New Brunswick, Ontario and Quebec - were joined three years later by Manitoba and the Northwest Territories. Sir John A. MacDonald, our first Prime Minister, still dreamed of a Canada that stretched from the Pacific Ocean to the Atlantic Ocean. In 1871 British Columbia decided to join Canada. The Canadian government and British Columbia made a deal - BC would join Canada only if the government built a railway across the country. Sir John A. MacDonald agreed and promised that it would be built and finished in 10 years. It wasn’t until 1878 that construction was able to be really started and the 10 year deadline was running out. Sir John A. MacDonald needed to prove he was serious so he got construction going. The government hired Andrew Onderdonk to start construction of the western part of the railroad. Over the next seven years 15,000 men, many of them Chinese immigrants, built over 545 km of railroad from Port Moody to Eagle Pass. Slowly but surely, construction went ahead - it had to go through some very dangerous areas in the Fraser Canyon and the Rocky Mountains. Many workers lost their lives in the process. 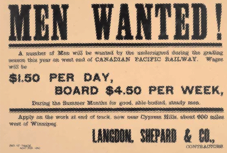 Even though the 10 year deadline passed and the railroad was not finished - the people of BC saw all the hard work that was being done and so they agreed to stay part of Canada. With construction started in British Columbia, it was time to get things rolling in the east. On February 16, 1881 the Canadian Pacific Railway Company was officially created and the Canadian government gave it $25 million and 25 million acres of land to use in the construction of the railroad. In the first year, only 211 km of track was laid - not very good and so William Cornelius Van Horne was hired to get things going faster. With Mr. Van Horne in charge, 673 km of track was built the next year. Things were coming together but they still needed to conquer the Rocky Mountains and that was no easy job. Major A.B. Rogers, a surveyor, got to work finding a way through the Rocky Mountains and Rogers Pass was named after him - recognizing all his hard work. When you drive on the Trans-Canada Highway today, you are following the original CPR route through the mountains. The CPR soon found out it was very expensive to build railway tracks through the mountains. By 1885 the company had run out of money and needed more to finish building the tracks. At the same time CPR was having financial difficulties, Canada was dealing with the Second Northwest Rebellion on the Prairies. The government needed to get soldiers from eastern Canada to the West to control the unrest with the Métis and some of the First Nations peoples of the region. The nearly completed railway was used to move troops to the area in less than 10 days. This proved to the government how useful a railway was to the country and the government decided to help CPR with its financial difficulties so the railway could be completed. Just a few months later, on November 7, 1885, Donald A. Smith drove the last spike into the railway tracks at Craigellachie, BC, to commemorate the track from the East meeting up with Onderdonk’s track from the West. Sir John A. MacDonald’s dream of a transcontinental railway was now real. Eight months later the first transcontinental train left Toronto and Montreal, on June 28, 1886, for the Pacific Coast.